As the weather has been hotting up lately, please remember to keep your dogs safe and DO NOT leave them alone in a car even for a few minutes when the temperature soars. A car heats up very quickly indeed and your dog can be severely affected by this, slip into a coma or even die due to the high temperatures and their inability to cool down. 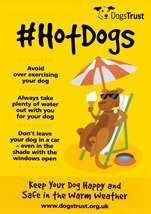 If you are travelling with your pet, please ensure you have water with you too to keep your furry friends safe. We are all very pleased to announce that all 10 of us completed the Moonwalk Scotland in Edinburgh on 10 June 2017. As we are all now back fighting fit again, we have had time to total the donations so kindly given to this worthy cause which to date is sitting at a MASSIVE £5,812.58. We would like to thank all who donated and we all feel so proud to have been a part of this team.